One thing that every teenager or a student would agree is that 90% of their homework and assignments in now done by the Internet itself. Squandering through all those Google searches, Wikipedia and looking for reports, essays and articles on dozens of websites just to get the work done. However, it is not limited to students only. From business professionals, Researchers and many other people also use it in the same way. Nowadays, many custom writing websites are present here to help you with this stuff. These sites offer custom writing based services which they charge affordable prices. The services are excellent and provide full customer satisfaction for future references and a good clientele. The need of using one such service occurred to me a few days back. I had to submit a report for my college assignment. Being a part time blogger and marketer, it is quite difficult to manage both my work and college. That’s why one of my friends recommended me to go for custom essay writing services online. 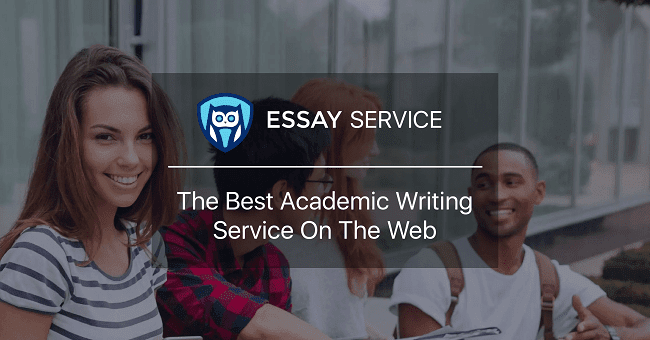 Now, every essay writing services strive to be on top and offer better quality and reliability to satisfy their customer’s whim. One such great website that I relied upon is EssayService.com. It offers various writing services for essays, articles, assignment reports, book writing and much more. See Also: - How to Hook a Reader With The Best Chosen Blog Topics? The site hosts academically and professionally qualified writers, editors for best output quality. 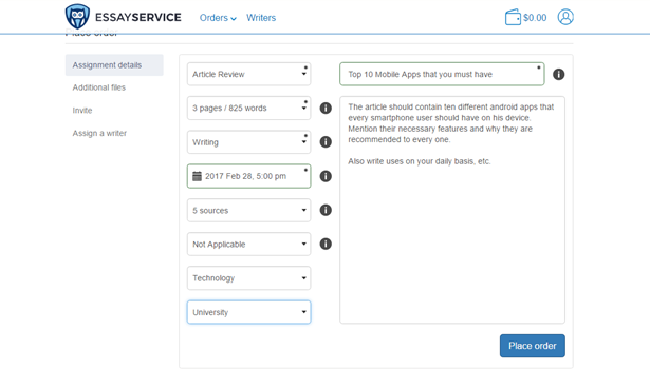 So, without any talking, let’s get started with the review of EssayService. To get started with your essays, reports or whatever requirements, you first need to calculate your budget, submission deadline and the number of pages (Word Limit). The homepage of EssayService has a dedicated form that calculates the price on your requirement basis. However, you need to sign-up on the website for rest of the process. Just log in with your email, social media login with Facebook and Google+ is also available. 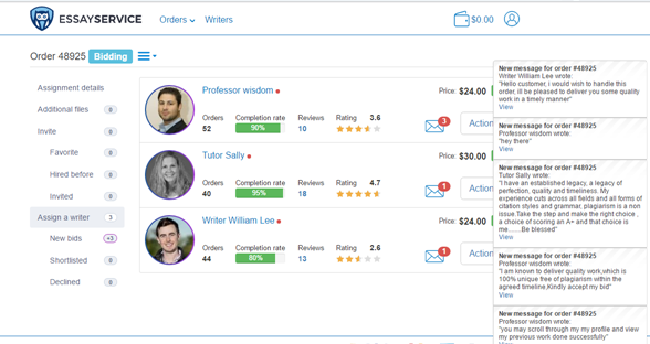 After the registration process, you’ll be redirected to a dedicated dashboard where you can manage all your writing orders. To book a new custom writing service, you need to fill the assignment details, and then only you can hire a writer for the proper purpose. Once you’ve filled all the necessary details like the article deadline, category, style, topic, description, etc. then you can place your order for the next step. The application is then processed into the bidding state where the writers shortlist your submission if it suits you. It usually takes 10-15 minutes and someone would respond regarding your request. However, your dashboard would be filled with multiple application within 5 minutes or less. You can mention the urgency of the required content as it would be more feasible for the writers. Once, the bidding process is initiated and a handful of writers have applied for the gig, then you can hire any of them per their ratings, experience and skills. The one most important criteria to choose your writer depends on the ratings and the completion rate. The prices of the writers also vary as per their ratings but it all remains under a similar affordable slot. You can shortlist few writers and then select the most eligible one that fits your budget. Once you’ve done the shortlisting and hiring process, you can then chat with the writer regarding the assignment. Keep him/her informed of all the minute details that you require and wait for the deadline. I hired the writer with 4.8 ratings and got my review delivered within the timeframe. A few changes and amendments were needed to change but I was fully satisfied with the services. EssayService offers an array of writing and editing related services to its customers worldwide. From Custom Content Writing, Proofreading, Rewriting and to Editing services, the website packs it all. The prices of the writing services vary with the type of writing, deadline, and the word limits. Rewriting and Editing Services are also offered by the website where you can mention the desired changes to be altered in your article, report, etc. and the hired writer would present you with the final draft within the writing deadline. Apart from these, EssayService offers quality proofreading by professionals at affordable prices too. 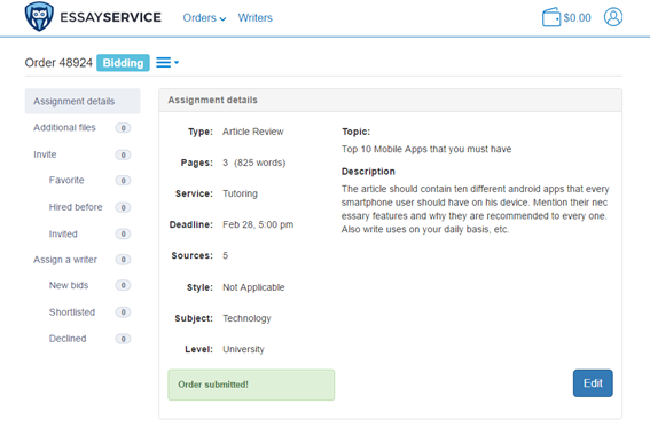 I hope you liked my review on the custom writing and editing services offered by EssayService.com. The website is best known for its article, and review writing for academic purposes. Do share your thoughts on the services that this site has for all your content-related requirements. Comment below If you’ve used EssayService for such purposes and your experience with their services. Cheers!